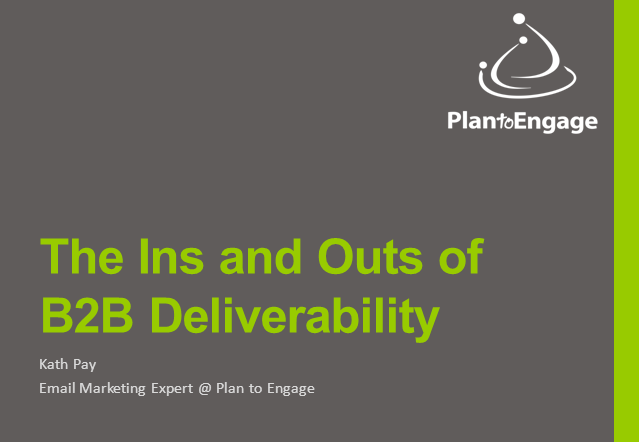 In this webinar, Kath addresses the unique challenges that B2B marketers have in getting their emails delivered to the inbox as well as providing a checklist for better deliverability in the B2B environment. Kath Pay is a veteran of 13 years in the digital marketing industry and she is not only seen a lot of changes, but has directly participated in making some of them happen. She is proud to have witnessed email marketing become an essential channel for integrated digital marketing that delivers a measurable ROI. In 2001 Kath Pay co-founded Ezemail, one of the pioneers of the email marketing industry in Australia, expanding it into the UK in 2004. Before concentrating on email marketing and other online marketing channels, she owned a small Web Design agency with extensive expertise in HTML coding, designing, internet marketing and Search Engine Optimisation.